I’ve had three more New Realm 5 x 5 paintings find new homes. This series is shrinking quickly thanks to the holiday season. “Butterfly,” “Ladybug,” and “Dreaming” have all sold and are from my 5″ x 5″ series which “spotlights” different characters and scenes from “New Realm.” All are acrylic on canvas. To view more of this series as well as the larger “New Realm” paintings, visit my website at this direct link: AmyGuidry.com New Realm. Also, be sure to go to the Contact page of my website to enter to win your own 5″ x 5″ painting. One of the first 200 people to enter will win! 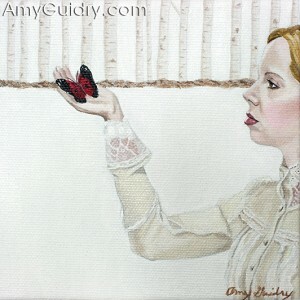 www.amyguidry.com/contact.htm. I nearly forgot to post photos for the exhibition I have going on right now… the opening reception was in November, but the exhibit is currently open through December 30th. (So there’s still time to see it even if you are stuck in a shopping mall somewhere until the 25th.) I have a few photos to share from opening night for “Like a Prayer: Reflections on the 21st C Feminine” at Barrister’s Gallery in New Orleans, LA. More photos are on my website under Events- www.AmyGuidry.com. The show was curated by Martina Batan, Director of Ronald Feldman Fine Art, New York. 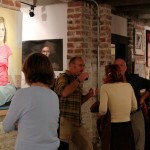 There was a great crowd and in conjunction with the St. Claude Arts District (SCAD) 2nd Saturday Artwalk, the Multispecies Salon 3 was also open. Very busy night! 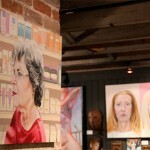 If you missed out, you can still see “Like a Prayer” at Barrister’s, now through Dec. 30th. Another sold painting! “Journey” has found a new home and is amongst a great art collection. This is from my “New Realm 5×5 series” which consists of 5″ x 5″ paintings, each spotlighting different characters and scenes from the “New Realm” series. It is an acrylic on canvas and completed in 2009. There are several others still available ($150-$200), and there are still a couple of days left to purchase and get one shipped out for Christmas! View more paintings at this direct link: AmyGuidry.com New Realm series. Contact for purchase at http://www.amyguidry.com/contact.htm. While you are there, enter to win an original 5″ x 5″ painting from the “New Realm” series! Book Cover- "New Realm- Works by Amy Guidry"
I’m excited to announce that a book of my “New Realm” series is now available! This is a 40-page book which features paintings and original concept sketches from the “New Realm” series as well as an artist statement and a foreword by myself. There is an online preview of the book- note that it is not of the entire book, but it does feature several pages. You can also purchase the book online as well. I personally have the “Perfect Bound Softcover- Premium Photo Printing” version (last option listed), but you can also get a hardcover version as well as different qualities of paper. 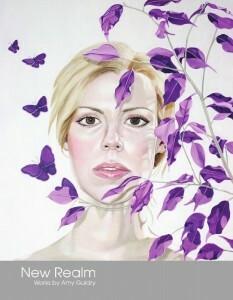 Preview and purchase the book at this direct link: http://www.viovio.com/shop/84634. I’m posting my latest painting… I had photos taken and it sold the very next day. 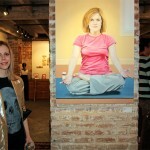 So I never actually had it posted on here beforehand or on my website, www.AmyGuidry.com. So here’s the first look… This is “Untitled”, a 6″x 6″ painting from my “In Our Veins” series. 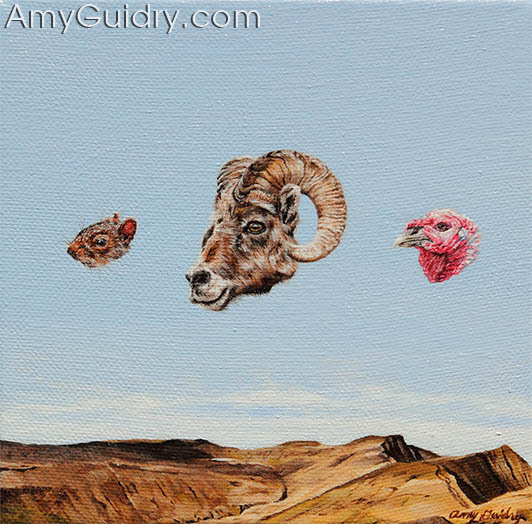 It’s inspired by another painting from the same series- “Untitled (Heads).” As a vegan, I’m always perplexed/frustrated/disturbed by the concept of animals being nothing more than parts- head, hoof, breast, wing, rib, rump, the list goes on. Animals are viewed as merely a means to an end. So with “Untitled (Heads)” and this newest painting, “Untitled,” I wanted to convey this concept in a Surrealist manner. As with its predecessor, this is an acrylic on canvas. All the tiny hairs, spots, and eyes of the ram, squirrel, and turkey caused me to go through several 00 round brushes. So several trips to Michaels later, here is the finished piece! On another note, as a reminder I am having a contest to win one of my New Realm 5″ x 5″ paintings. To enter, sign up for my newsletter at this link- AmyGuidry.com Sweepstakes. One out of the first 200 people to sign up will win!